In researching our trip to Iceland, I heard that a day trip to Greenland from Reykjavik might be possible. Greenland? This brought up several other questions for me. How can you visit Greenland? Specifically, how do you get to Greenland? How far is Greenland from Iceland? What’s the difference between experiencing Iceland vs Greenland? And who goes to Greenland anyway? 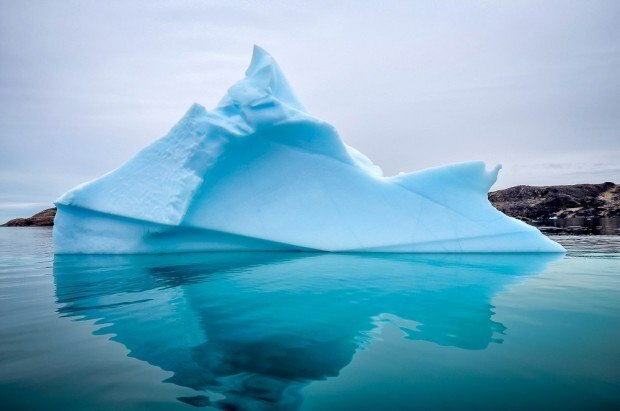 I immediately became captivated with the idea of visiting Greenland and I knew that we HAD to go. Convincing Laura that visiting Greenland was a good idea would be another story. Here’s everything we learned about trips to Greenland from Iceland. Our first real decision was how to get to Greenland? We found some airlines offering day trips from Iceland to Greenland. Alternately, if we’re going to Greenland, we could add a couple of days and really explore, however the trip was proving to be long enough with our limited vacation time. Most of our long discussions came down to whether we would like take the quick trip from Iceland to Greenland. Once before, I wanted to do a day trip to somewhere crazy (from Spain to Gibraltar). At the time, I was accused of just wanting to collect a Greenland passport stamp (which, since Denmark owns Greenland, is the stamp of Denmark – or, to be more specific, Greenland is a partially autonomous constituent country within the Kingdom of Denmark). And it went much that way this time. I’ll admit, that was part of it. 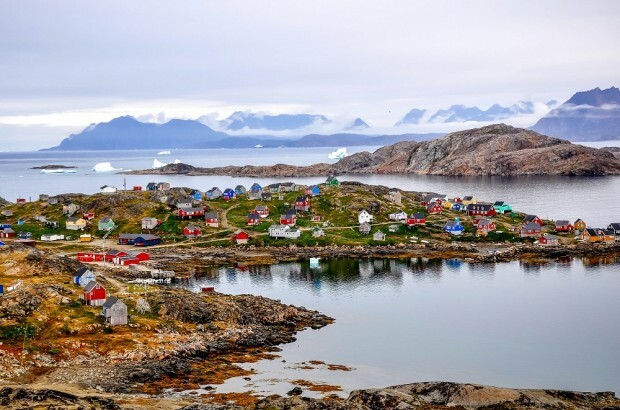 But how often do you have the opportunity for visiting Greenland? We don’t have a lot of vacation time, and tacking the quick trip on to our time in Iceland just made sense (to me, anyway). There’s really only two ways to get to Greenland. The first is to fly from Iceland to Greenland. 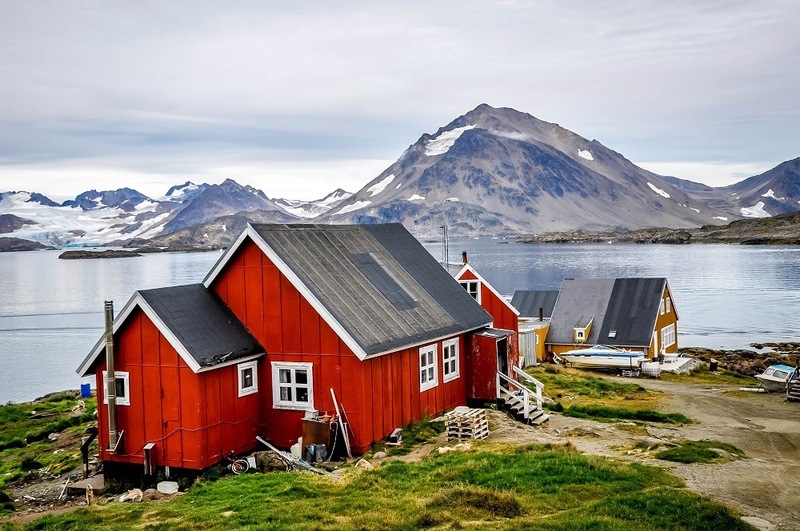 There are flights to Greenland from Iceland (via Air Iceland Connect) and Denmark (via Air Greenland). However, there are still no direct air service from the United States. So, if you’re wondering how to get to Greenland from the US, most people fly to Reyjavik with IcelandAir and then take an Air Iceland Connect flight on to either Nuuk or Kulusuk, which is actually kind of strange since Greenland is part of North America and you’d think you could fly direct. The second option is that there are a number of cruise lines that are beginning to add Greenland as a port to their sailings. Contrary to popular belief, there is no Iceland to Greenland ferry. The good news for travelers is getting to Greenland is getting easier every year with more travel options available. My motives in this Greenland vacation were more about country collecting or getting that Greenland passport stamp. Before we left on the trip, the cover of National Geographic was about Greenland being Ground Zero for global warming. I wanted to see it for myself. Laura finally gave in. We got up early and headed to the tiny Reykjavik city airport for the flight. 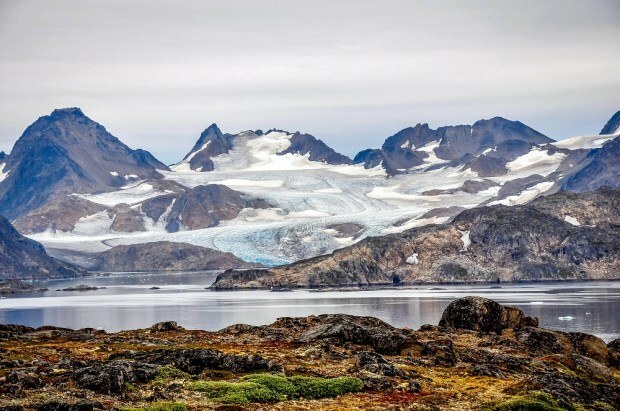 The Air Iceland Connect flight from Reykjavik to the hamlet of Kulusuk, Greenland took a little under two hours and covered a distance of just over 450 miles (725 kilometers). Once in Greenland, we crossed through security and found the guide, a gent from Iceland who had lived in Greenland for some time. He originally came to Greenland as a sociologist to study the indigenous population and ended up seeing a money-making opportunity and stayed. In Kulusuk, we walked from the airport down into the town, stopping at the cemetery ridge for a view of town. At about this time, the midges found us. These crazy little bugs are attracted to CO2 and fly into your mouth and up your nose. They made us miserable, but there was nothing we could do to keep them away. I wished we had had netting to get the bugs out of our faces. 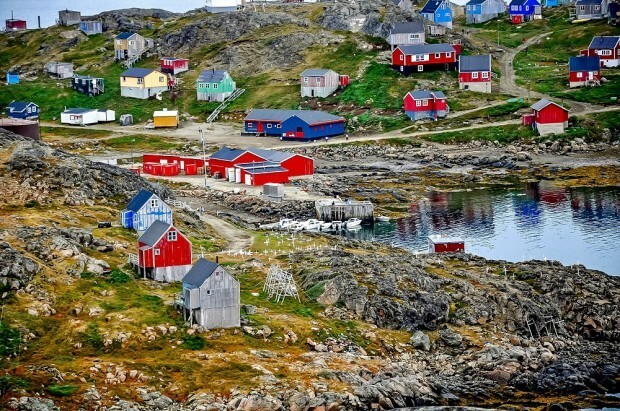 Kulusuk is a small village where all of the little buildings clinging to the rocks are painted in picturesque reds and greens and blues. It was very charming…from afar. The locals in Eastern Greenland have progressed rapidly. In just over 150 years, they have moved from tribal hunter/gathering in seal skins to driving ATVs and wearing North Face. But, like most native peoples, they have over 80% unemployment and an extremely high level of alcoholism. 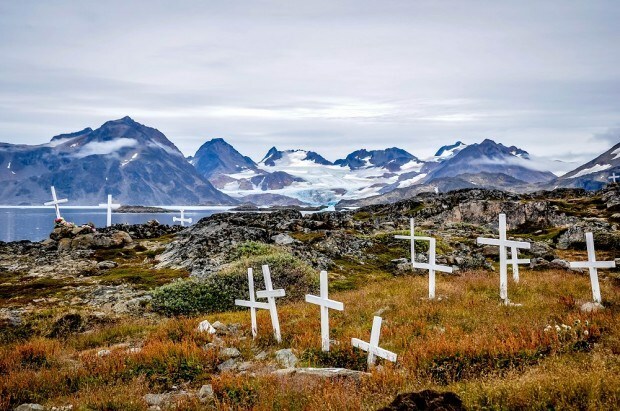 When we were in Kulusuk on a Saturday, the few locals with a job had been paid the day before and the entire town was drunk – including some boys as young as about 10 or 12. Our guide explained that this was pretty typical right after pay day. It was quite sad. We wondered if this was typical for the entire 57,000 population of Greenland, or whether it was specific to this island. Our first stop was the town’s all-purpose store. It carries everything from groceries to clothes to guns and ammunition. An unusual mish-mash of merchandise, but it gave us a glimpse into the sparse lifestyle of the people and was a strong reminder of how remote Kulusuk is. There is one gift shop in town, which our guide opened up for us. The store sells exactly the same merchandise as the Kulusuk Gifts store in Reykjavik – t-shirts and expensive bone carvings. 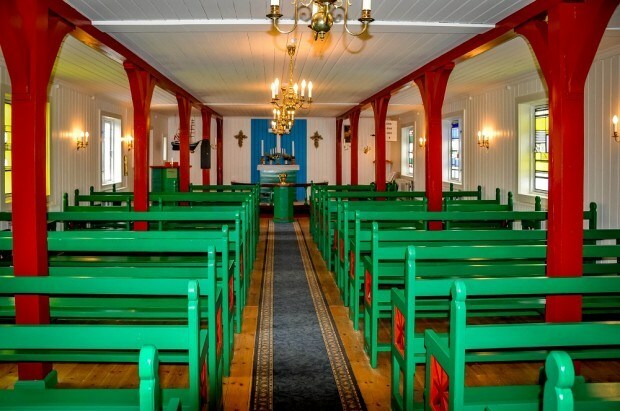 He then took us over to the brightly-colored church for a brief 10-15 minute history lesson on Greenland. We then went into a woman’s house for a drum ceremony demonstration – it could have been really good, however, without providing any cultural context, it was just kind of weird. And somehow Laura got roped into participating. Actually, that really sums up our trip. Our guide studied the local people in Greenland for his degree and could have provided a really rich cultural discussion and been really informative. Instead, he seemed to be more focused on wanting to open the gift shop and sell things. The most rewarding part of visiting Greenland was boarding the boats from the town of Kulusuk and taking them out into the bay and past some MASSIVE icebergs. That was very cool! Yes, we got our Greenland passport stamp. Yes, we went to Greenland. And who goes to Greenland? It’s one of those places in the world that is very far off the beaten track and I’m glad we took this opportunity to go. But for cost of about $525 per person, we expected more. It was not the educational and enriching experience that we were hoping for, but I’m glad we did it. That night, after our Greenland to Iceland flight, we went out for dinner in Reykjavik. We had selected Argentine, one of the most popular restaurants in all of Iceland and one of the better steakhouses we’ve ever been to. The restaurant was excellent. However, it was an odd Greenland vs Iceland juxtaposition. Here we were enjoying a fabulous meal after having spent much of the day with people who were really struggling. Visiting Greeland was one of the most remarkable experiences of our lives, but it was both intellectually and emotionally challenging. Perhaps more than any other destination we’ve ever visited, our journey to Greenland has stuck with us. There are times I can still see the faces of some of the native children in Kulusuk. The Greenland climate is changing thanks to global warming, but Greenland changed us in ways we didn’t realize at the time. What do you think about Everything You Need to Know About Visiting Greenland From Iceland? Thanks for this! Ran across your page this evening as I was researching Greenland’s landscape. Lovely photos and informative commentary. Sounds like it was worth the trip! I loved this post and the pictures of Greenland look amazing. I was wondering what time of the year you traveled to Greenland though. I’m going to Iceland at the end of November and would love to travel there for a day only. Do you think this is possible in November? Would you mind sharing the information of the guide, etc that you used to do this trip? Many thanks! Nice photos. Looks like a crazy but fun day trip. I want to go to Greenland as well but hope to spend more time there. What a picturesque little town! 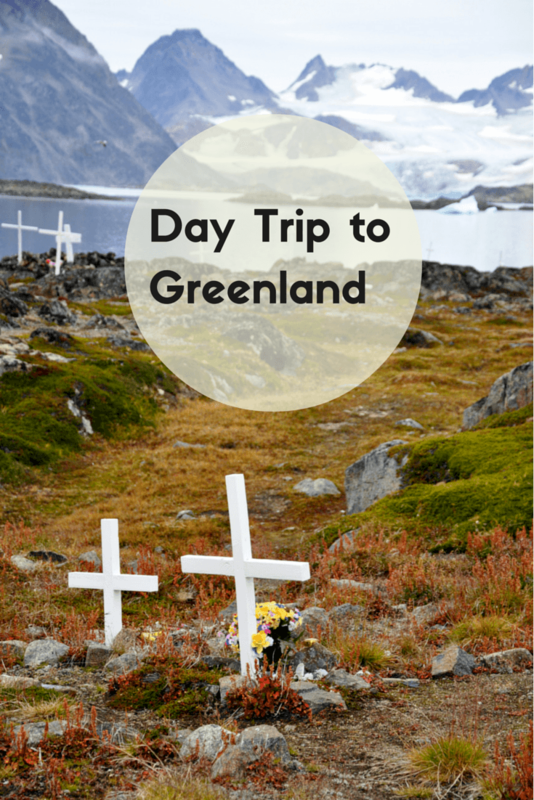 I had no idea you could do a day trip to Greenland from Reykjavik. Might be something to consider if I make a trip back to Iceland. Just a shame your trip didn’t quite live up to expectations. We’ve also been to Kulusuk and there’s just not a lot to do there since the village is so small. We spent the majority of our time walking from the airport to the village and then on a boat ride around the icebergs. The icebergs are amazing. I’d like to go back and see more of Greenland because I was definitely intrigued! Wow Mark. West Greenland looks much, much more built up. I’m very conflicted about our time in Greeland, but I feel there’s still something about the island. So, yes, I’d like to go back some day. Beautiful photos! 🙂 Would love to get to Greenland one day… it seems like one of the last untouched frontiers! When did you go and how do I contact Air Iceland to go? We went in September 2010. We booked via the Air Iceland website. 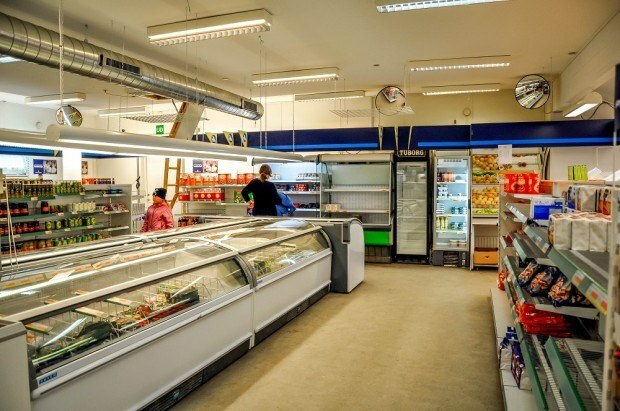 I came across this article since I just came back from Iceland. I was really wanting to go visit Greenland but I didnt see any flights there. I still plan to visit. I havent come cross many articles of people who have traveled there. I did find a 9 day Reykjavik and Greenland tour option with a 4 day cruise to greenland. I think I’ll take that option. Many of the flights to Greenland are seasonal, so it likely depends on what time of year you are looking for.